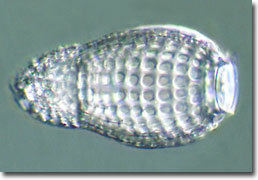 Diatoms, small zooplankton (such as copepods), and other protozoans serve as food sources for the predatory radiolarians. Prey is captured by members of the holoplanktonic radiolaria by engulfing it with their pseudopods, a feature shared by their relatives, the amoebas. The thin, linear ray-form plasmopodia are stretched through the pores of the tests to secure unsuspecting plankton and then retracted when the prey is secured. Digestion occurs in the central cavity. Although most are predatory, radiolaria exhibit wide behavioral variety and include some species that are filter feeders and others believed to be symbiotic with unicellular marine algae (zooxanthellae; more commonly known as dinoflagellates). The dinoflagellate symbionts are enclosed in a thin envelope of cytoplasm produced by the host radiolarian's rhizopodial system. Radiolaria provide ammonium and carbon dioxide for the dinoflagellates, who return the favor by providing the host with a jelly-like layer that serves both for protection and capturing prey. 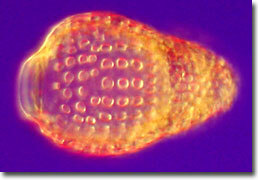 In relationships with marine algal symbionts, the host radiolarian is provided with much needed nourishment when food is scarce, allowing it to survive for several weeks without prey. This type of mutually beneficial relationship is generally found only within radiolarians that dwell in water that is shallow enough to receive significant amounts of light (water in the photopic zone). Although they occur widely distributed in the world's oceans, radiolarians are generally concentrated in low-latitude areas. 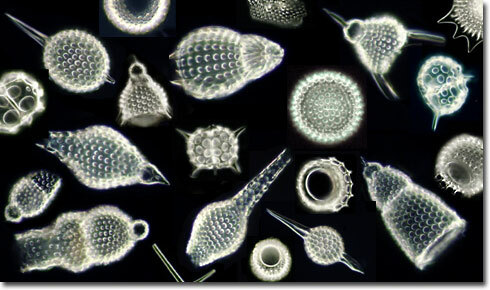 The warm, rich waters of the equatorial zone are home to the most abundant radiolaria species. Radiolarians flourish throughout the water column, from the surface layers to hundreds of meters in depth. As with other marine planktonic organisms, the distribution and abundance of these microzooplankton are dependent on the quality of the water in their environment, including such variables as water temperature, salinity, silicon availability, and the occurrence of suitable nutrients. 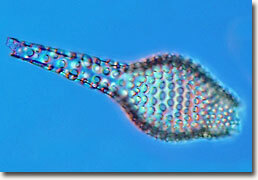 Radiolarians compete with diatoms for the limited dissolved silica (silicon dioxide) resources available in the ocean waters, which is required by both organisms for building exoskeletons. Cytoplasm from these microscopic marine creatures contains numerous vacuoles that fill with air to keep the animals afloat in the upper ocean waters. The nearly spherical symmetry of radiolarian silica tests, and the numerous extending spines and spicules, add to the buoyancy of these unicellular organisms, enabling them to drift along the ocean currents. The nucleus is surrounded by a central capsule of chitin and is the site of cell division during reproduction. The central capsule, separating the endoplasm from the ectoplasm, is a characteristic that distinguishes the radiolarians from other protists. Radiolarians usually reproduce asexually, by division of the cell (including the exoskeleton), with the resulting daughter cells each regenerating a complete organism. In many cases radiolarians can also reproduce sexually. Ranging in size from 2 to 30 micrometers in diameter, the unicellular radiolaria feature a diversity in shape and geometric pattern that rivals the finest cut crystal glass creations. Although many species are solitary, there are colonial forms of these marine organisms (built from hundreds of radiolarian cells) with exoskeleton diameters ranging from several millimeters to a centimeter or larger for spherical colonies. When colonies form cylindrical or filiform aggregate geometries, the combined structures can range up to several meters in length, held together by simple siliceous networks. The radiolarian exoskeleton, featured in the photomicrographs presented in this section, is encased in the cellular cytoplasm with the bulk of the test being set in the ectoplasm. This anatomical feature ensures that the amorphous silica skeletal structure is never in direct contact with seawater, reducing the risk of dissolution in a hostile aqueous saline environment. 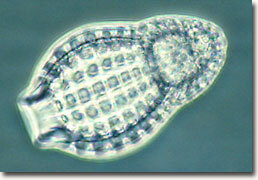 When radiolarians die, their tests usually sink and accumulate on the ocean floor in biogenic sediments. Contributing to the pelagic oozes that date back millions of years, the ancient radiolaria skeletons are often useful in geological dating experiments, climatological studies, and oil exploration. The process of biogenic sedimentation, which began with primitive members of the radiolaria during the Early Cambrian period, continues on today. Unlike the diatoms, where perhaps 90 percent of the documented species are still living, approximately 90 percent of the several thousand described and indexed radiolaria now exist only in fossil form.